The third Brook programme, hosted by Matèria Gallery, presents films by Séamus Harahan and Carole Roussopoulos. Here, narratives of freedom and containment are developed as spaces to imagine social, sexual and political agency. Three video works will be on view: Séamus Harahan, Holylands (2003), 32 minutes, presented at intervals; Carole Roussopoulos, S.C.U.M. Manifesto (1976), 27'25 minutes, and La marche du retour des femmes à Chypre [The march of the women's return to Cyprus] (1975), 35'46 minutes. Séamus Harahan (b. 1968, London) lives and works in Belfast. He has had many solo institutional exhibitions including Holylands, Wolverhampton Art Gallery, Wolverhampton, UK (2010); Nought to Sixty, ICA, London (2009); LONELY AT THE TOP sound effects #1, Museum van Hedendaagse Kunst (MuHKA), Antwerp, Belgium (2009) and Holylands, Transmission Gallery, Glasgow (2004). In 2005 he represented Northen Ireland at the 51st Venice Biennale, where Holylands was presented. He received the Paul Hamlyn Foundation Award for Artists in 2009 and won the Jarman Award in 2015. He is represented in London by Gimpel Fils. For almost two years between 2001 and 2003, Séamus Harahan filmed what was happening in his neighbourhood of Holylands, Belfast. He used a basic video camera, pointing it through the window of his home. 'Holylands' was named after its streets - such as Jerusalem Street, Damascus Street and so on. The film documents people passing by, redundant objects and activities. In doing so, it shows how the very rhythm, the very core, of the city, is embodied in these seemingly mundane things. Barely edited footage of day to day life - of kids hanging out on the corner, a man collecting rubbish to keep the place tidy, the rear lights of a white van flashing, and a boy jumping over a wall - is collaged with slurred moving images of simple objects. Each fragment is narrated through accompanying songs, which differ as frequently as the image, moving through traditional Irish music, hip hop and jungle, with beats and lyrics which set a pace and draw on themes of memory and recovery, both on a large social scale, and a very intimate and personal one. Carole Roussopoulos (b. 1945 - d. 2009, Switzerland) is a pioneer in the field of video and documentary. She purchased her first camera in Paris in 1970, a lightweight Sony Portapak, as suggested to her by the writer Jean Genet, who she filmed discussing Angela Davis' captivity in the same year. With her partner Paul Roussopoulos, she formed Vidéo Out and created what now constitutes a moving image archive of feminist and gay rights activism, anti-imperialist and workers' protests, filming public demonstrations, international marches, meetings and conversations. In 1975, Carole began to hold video workshops in her apartment, which led to her meeting the actress Delphine Seyrig and the translator Iona Wieder. Together, they founded the collective 'Les Insoumuses', a play on words which combines 'insoumise' ('disobedient') and 'muses'. Within this frame, the pair worked to investigate modes and systems of female representation. S.C.U.M. Manifesto (1976) is a collaboration between Carole Roussopoulos and Delphine Seyrig (Les Insoumuses). 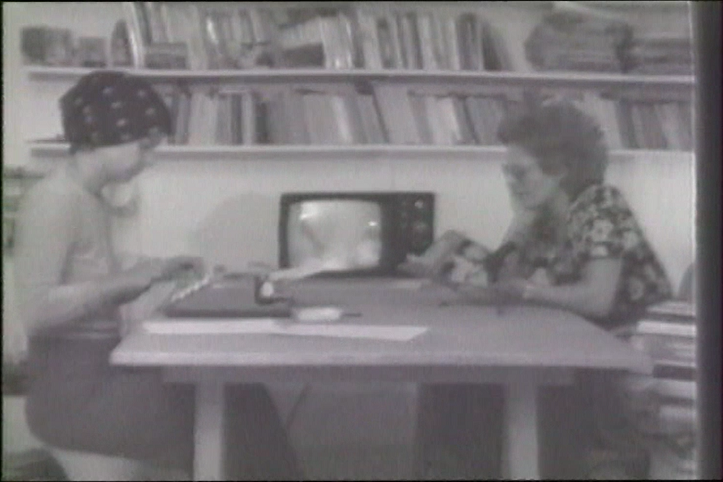 The video stages the reading and re-typing of some passages of Valerie Solanas' satirical pamphlet against patriarchy. In the film, Seyrig, sitting on the right, dictates excerpts of the text to Roussopoulos, who types - at first - diligently. The news plays on the TV in the background. In May 1975, an international women's march was organised to obtain the application of a UN resolution ordering the Turkish government to let the Greek Cypriot citizens regain their homes. 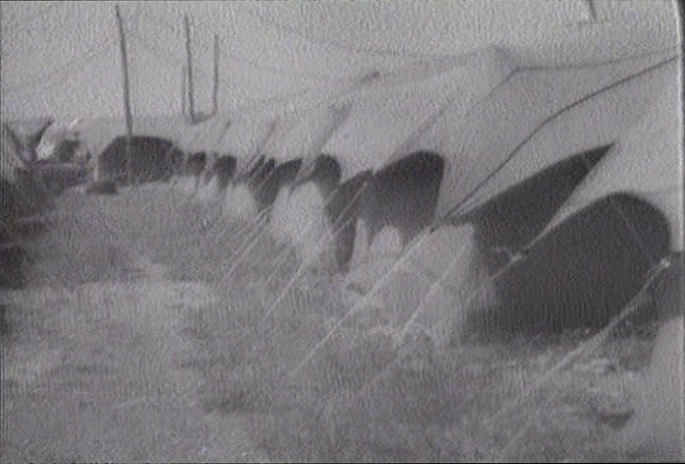 La marche du retour des femmes à Chypre [The march of the women's return to Cyprus] (1975) follows women living in refugee camps with their families, allowing them to express their political analysis of the conflict and to tell their pain. Brook is an evolving video programme designed to promote artists' video work, moving image, sound or text based practices across borders. Brook is brought to life by curators Róisín McQueirns and Rosanna Puyol, the artists showing their work and the spaces hosting us. Please join us for the opening of the programme at Matèria gallery on Thursday, July 13th from 7 to 10pm. For further information please contact the gallery at contact@materiagallery.com.